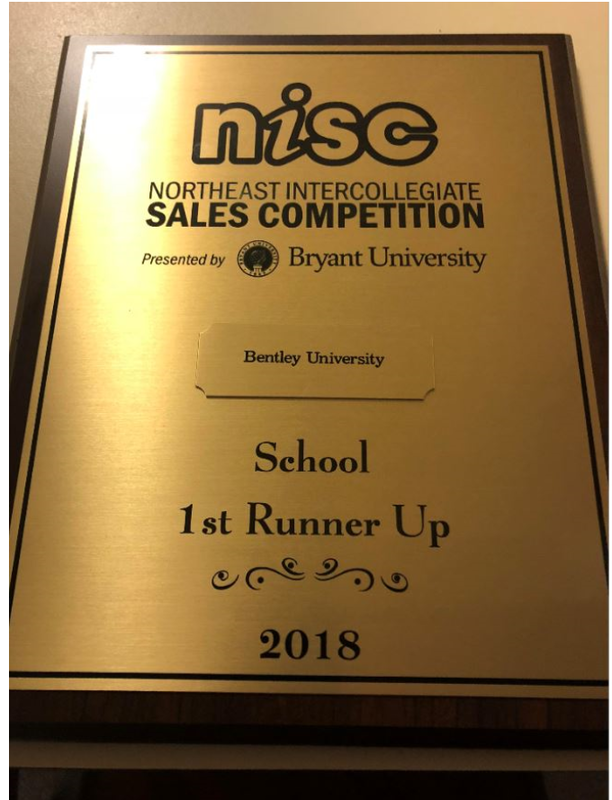 7th Annual Northeast Intercollegiate Sales Competition (NISC) where the team earned a Second Place finish among 24 participating universities! Bentley’s own Erin Iwamota, ’20 finished in 2nd Place against over 100 other competitors! Patrick Sullivan finished in the Quarter-Finals against over 75 other competitors. Other team members included Michael Young, Brandon Newton, Nedjie Thompson, and Nathan Boutwell who all fared very well. Competing universities included the University of New Hampshire, Plymouth State, Southern New Hampshire University, and schools from as far away as Lasalle University, Ryerson University, Purdue University and Kansas State. The Bentley’s Professional Sales Team worked diligently for two days each week since the beginning of the Fall semester. The team was coached by Adjunct Professor Gary Johnson (MGT) and assisted by Bentley alumni: David Bakstran and Brendan Kelly, each a proven Sales Professional who found their business acumen at Bentley. The tournament offered the opportunity for college students to compete for cash prizes, receive individualized feedback and coaching from experienced sales professionals, attend skill and leadership building sessions, network and explore potential internship and job opportunities. The main competition was a multi-round role play where the student is given a real-world selling situation as the representative of a consulting firm. Each competitor is video-taped and graded by a team of judges. The students role-play for the highest score against seven strict judging criteria to advance to the next round. Sponsors and potential employers included Dell/EMC, Comcast Business, Cox Communications, Frito-Lay, CarGurus, Liberty Mutual and many others. Dozens of students, including some of our own, were offered job interviews on site. While the challenge of a lifetime for many, it was a festive atmosphere for two days filled with opportunity beyond Bentley. And Bentley, once again, showed its place in the business community.